I am really happy that this weblog has still visitors daily but I should say this weblog was originally created for the projects I had done before joining National University of Singapore as a PhD student and it is not updated since then. Working on a single project for my PhD, there is minimum to share here for now but I hope my future job gives me the opportunity to work on many projects and I hope to share my experiences in details with you guys so that we can learn from each other. "For a finite-size system to persist in time (to live), it must evolve in such a way that it provides easier access to the imposed currents that flow through it." Constructal law is the non written law of nature, the tendency in any flow system to reach the maximum performance. From this point of view, constructal theory is a complimentary to second law of thermodynamics. As the second law of thermodynamics predicts the direction of events, shape generation is not provided by it. For example, a river has a pathway which goes through it. Second law predicts that a river runs from higher altitudes to lower altitudes but it does not tell us the shape of the river. Invoking constructal theory is not as simple as its statement. Worth to mention that, Constructal law is not an optimizing algorithm like genetic algorithm. Thus, there is no direct mathematical procedure which can be used to predict the shape of the flow systems with it, and this means that each specific problem needs its specific solution. Any flow system has some degrees of freedom for its shape change and based on constructal law, if we provide it all the freedom needed; it will change in time until it reaches its maximum global performance. This trend is somehow an evolvement from simple to complex through time and that’s a trend which is used in nature in the whole passed time. Based on what stated above, for any problem which is going to be represented in this frame, degrees of freedom should be identified and after that, global performance versus these degrees of freedom will have an optimum point which is the best. This means that if the system wants to evolve in a natural manner, from any point it starts it will change in time until it reaches this optimum point. Consider it is supposed to distribute water from point A to points B and C, and this distribution is done by a Y junction. If all the degrees of freedom constrained except for the split place, (namely L1) where the best place for the split is? Constructal theory says, if we give the freedom in certain directions to such a flow system, it (here L1) will morph to its optimum point of performance. One may say, ok! What is the difference between constructal theory and a simple search for an optimum configuration? Simply the answer is nothing but the constraints under which we find this best configuration. There are two global constraints: (1) the total construct volume and (2) the total space (area) occupied by the construct. Under the above constraints, we give certain degrees of freedom to the configuration to find the optimum point of performance. These degrees of freedom are applied to the flow system by means of analytical, numerical or even experimental investigations. After all, freedom to morph versus the performance makes the shape. 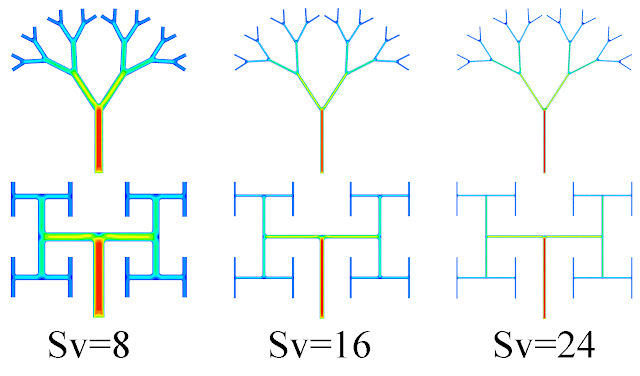 In this investigation, svelteness is introduced as an important factor which illustrates the importance of bifurcation angle effect on pressure drop and flow distribution uniformity in tree shaped networks. Moreover, the influence of mass flow rate and Reynolds number is also discussed. Results show that as svelteness increases, flow uniformity is enhanced while the effect of bifurcation angle, θ, on the pressure drop is diminished. The power-law relationship between Be and mass flow rate shows that the power component increases at higher values of svelteness which is in agreement with previously published work. Numerical simulations of the proposed networks showed that at low Reynolds numbers, flow distribution uniformity and thermal uniformity are achieved. Thus, expect for Sv, Re is also an important factor which should be considered when the uniformity is a goal. This fundamental investigation in Constructal realm is done in collaboration with Professor Mujumdar's lab in National University of Singapore. The results are presented in a research papers which is sent to Applied Energy Journal. SSP Company is one of the producers of hydraulic valves in IRAN. Fortunately, I have had the chance to work with this company since January 2010. 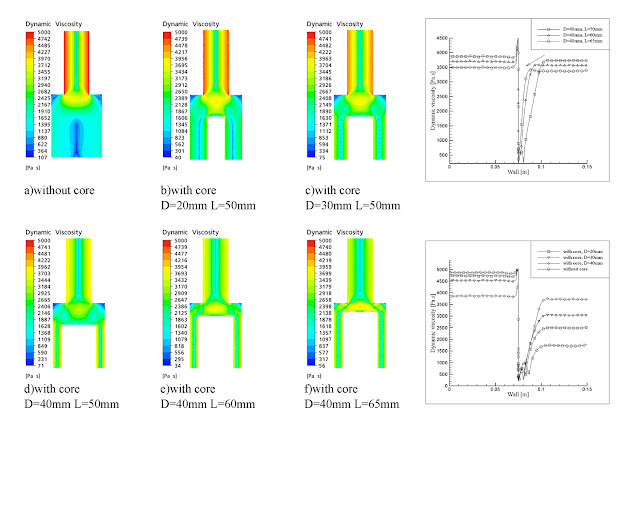 My job is to develop CFD simulations of current hydraulic valves for further enhancements. SSP Company is in its way to produce proportional valves and my next job is to simulate these valves. Because of the spool motion in such valves, this simulation needs mesh movement capabilities and solid-fluid interactions. For these simulations, I have used ANSYS-CFX as the solver. Moreover, meshes are produced by CFX-Mesh and ICEM CFD. Dear friends who have CFX class with me can download the lessons from this weblog after each session. I will update this post every now and then. Thus, please check it during the time. Abrasive flow machining (AFM) is a finishing process that is used for deburring and polishing the complex surfaces and inaccessible areas of the workpiece. However, the surface roughness will not be uniform when a complex hole is polished by this method. By using CFD, we can design an optimum tooling to get the uniform roughness throughout the passageway. In this study, we have offered a new trend toward the optimum design of the tooling, for machining a hole with diameter variation along its axis. Dynamic viscosity of the medium plays the main role in controlling the roughness on the entire surface. The behavior of the flow during the process was firstly simulated in normal conditions to get the distribution of dynamic viscosity along the axis of the hole. Then it was simulated again, when various cores with different dimensions were placed in the hole. The results showed that the diameter and the length of the core both have significant effect on the flow and the optimal dimensions can be acquired using this method, to get the uniform roughness throughout the hole. Based on this study, two papers are submitted to ISME2010 conference, which are accepted. Cooling a disk shaped body with reverting microchannels in it. This work is based on previous works done by prof. Bejan, prof. Pence and prof. Mujumdar. Cooling a rectangular shape body with dendritic designs. This work is based on previous works done by prof. Bejan and prof. Poulikakos. A paper has been submitted to HEFAT based on this research. And two more papers will be submitted. In the history we see men who write. These writings vary from mathematics and philosophy to novels and stories. In my opinion all these people wanted to have something to be left in the history. Something to convey their names and to make their names live in the people’s mind. Some of them have been successful like Socrates and Hafiz, and some not, but what is more important is the purpose of writing. Nowadays it’s somehow different. The internet has changed every aspect of our lives, and writing has also been affected. Weblogs come to be a space that anyone can express his idea. Again we see people who write but they do not have any reader. They write because they want to remain not to be read. At this post, I want to express the reason that made me to write.When I was at high school, my interest in physics and mathematics made me to study mechanical engineering. Honestly this choice was indiscriminate but when I continued, I found it exactly what I wanted. Now that I think of past days, I found experiences that some of them may happen to any student. I mean they are not unique at all. But the way that I think I’m different, (at least among the friends and students I know) is the number of projects I have been involved in. these projects that some were from inside the university and some from the outside, made me to create this weblog. I think this can help the students who have the same way of acting and thinking. This is an industrial project that I have recently started to work on. Abrasive flow machining is a process at micro scale that is used for surface finishing of the holes of devices that need accurate surface properties. My aim is to design fixtures that take place in the holes to guide the abrasive flow through them in the way that abrasive flow does its task with high efficiency. Abrasive flow is a non-Newtonian fluid flow and we want to predict its behavior with the aim of CFX software. In the figures below, you can see a schematic hole and the fixture in it. You can also see the primary CFD analysis. This was an analysis I did in relation with turbo machine course. The programs used: CFX, TURBO GRID, BLADE GENERATOR, ANSYS WORKBENCH. This was a research project I have done for the combustion course. I used two codes because in this way I could validate my results. Hoffmann furnaces are used vastly in Iran to produce bricks. Because the technology of these furnaces is quite old, there are lots of changes that can take place in the design of such furnaces to enhance their performance. The first step somehow is to understand the phenomena that take place inside it. Because the CFX code does not do 2D analysis, my emphasis was on FLUENT software. This is my first experience in chassis design. The car was designed to participate in SAE minibaja competition, 2007. In this design I just satisfied the rules of the competition and ergonomic issues. My next designs on chassis are with the aim of ANSYS MULTIPHYSICS. PARSA electrical car was designed and manufactured to take part in the Electrical Automotive design and manufacturing competition, held for the first time in Sharif University, Iran. I had two tasks in the team. 1- Chassis and frame 2- Body. I designed this chassis with the aim of ANSYS MULTIPHYSICS program. I also published a paper on the procedure of the design process with the aim of this software. This was simply a CFD analysis on two bodies. Ahmed body is a reference body, invented by Ahmad (1984) to predict the structure of flow that passes the cars. It specially was designed to simulate the influence of the back part of the cars. Since I had several CFD analyses on car bodies, I decided to validate my results with this body. I managed to produce the certain structures of the flow that Ahmed had predicted and the amount of error in drag force was less than %10. I used sheer stress transport k- model and RSM model. The result of this experience was a part of a paper I published at ISME2009. I also used it to validate the results of CFD analyses on APADANA and super mileage designs. VIVANA super mileage car is a super efficient car that was designed to participate in Shell eco marathon competition, Germany. As its name shows, the body of such car should be as aerodynamic as possible. We used CFD to predict the aerodynamic forces and minimizing them. I used the ICEM-CFD as the mesh generator and ANSYS CFX as the solver and the post processor. APADANA is a research on hybrid cars, commenced by Dr. Kadkhodayi. I am a member of the design team and I designed the body of this hybrid car with CATIA, ANSYS CFX and ICEM CFD. I also published a paper on it at ISME2009. The APADANA hybrid car has recently manufactured and its initial tests have been successful. PARSA electrical car was designed and manufactured to take part in the Electrical Automotive design and manufacturing competition, held for the first time in Sharif University, Iran. It ranked the second place in 2008. 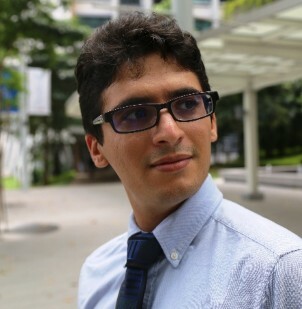 I’m a PHD student of mechanical engineering at National University of Singapore and an ex-student of Isfahan University of Technology. I have created this blog to send my research experiences to the web.